As far as my own class experiment is concerned, I decided to develop this completely from the ground up, with minimal tech support and minimal digital tools and skills, effectively making Oscar Wilde and the French Decadents a technically M(inimalist)OOC as well as a M(iniscule) one in anticipated size. I want to practically try out, experience on the ground and step by step, not just plan and speculate, how an ordinary, traditionally trained humanities teacher like myself can use digital components and social media (Twitter, Facebook, maybe Tumblr and Storify, nothing overly complex) to teach ordinary, traditionally taught humanities students right here, right now. The technology in this course needs to support and enhance the contents, not the other way around: no gimmicks for gimmicks’ sake. So, as I prepare for this new adventure and am starting to send out notices about the course to my network of colleagues, academic listservs, and Twitter, I want to keep it pretty simple and focused. I cannot solve all the problems there clearly are with humanities MOOCs, and I certainly cannot handle thousands of students all by myself, nor do I want to, right now. I am most interested in figuring out what the digital tools (limited as they still are!) allow a traditional humanities teacher like me, and typical humanities students like my students (most of whom, when I asked today, did not have Twitter accounts yet) to do, with relatively little financial or technical support, in the real, messy, wonderful world of a rather typically organized analog classroom. We need to think about and experiment with many different ways we can use the new digital technologies online—and not just focusing on assessment, as most of my humanities colleagues (and I) agree, multiple choice and short essays just don’t cut it for us anyway. Let’s start dreaming up new exercises, new collaborations, new ways of teaching deep research skills, that draw on the unique structure (and make students aware of the many pitfalls) of the internet. As I’ve written previously, I feel energized and deeply interested by the new possibilities the recent MOOC experiments have opened up: the untrodden new avenues and as yet unrealized chances for the humanities to disseminate their knowledge and skills more democratically and globally. But I also think that digital teaching in humanities courses will only be successful if it helps us do two opposite kinds of things at the same time: one the one hand, it needs to support and enhance the inherently humanistic classroom activities we already do well and passionately believe in—teaching close reading, critical thinking, and critical (skilled, persuasive) writing, the central pedagogical goals in most humanities classes—and on the other hand, it needs to show us notoriously skeptical humanists new (dare I even mention better?) ways to teach those things. If I—as a humanist who believes in the power of close reading as a tool to develop attention to detail, empathy, and ultimately a democratic mindset through complex, often paradoxical interpretations that students must learn to negotiate—if I, as such a humanist, discover that the digital toolbox opens up innovative ways of doing close reading, critical thinking, writing (you name it), what’s there not to be excited about? What do we stand to lose by trying to think this through, rather than not trying at all? Because, you know, after all “there is only one thing in the world worse than being talked about, and that is not being talked about” (Oscar Wilde). 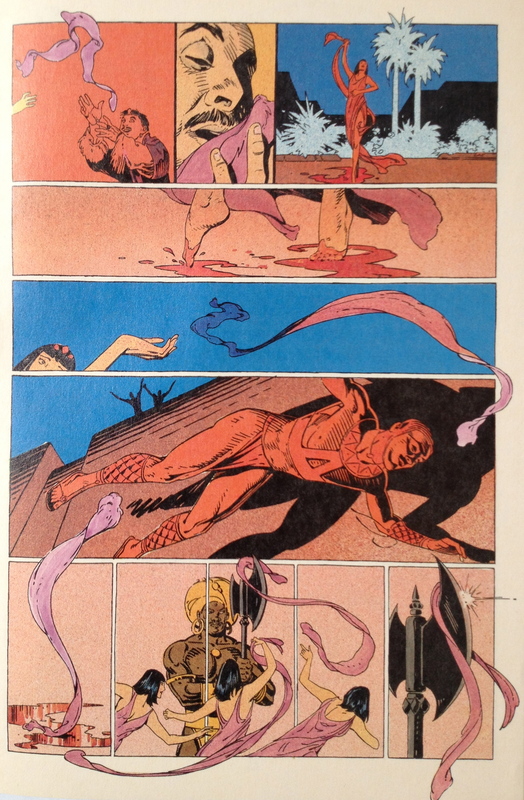 I recently finished an academic article on a very interesting 1986 comic book version of Oscar Wilde’s Symbolist play Salomé (1891), entitled “Salomé in the Comics: P. Craig Russell’s Intertextual Adaptation from Strauss and Wilde.” In the spirit of open-access scholarship, it will be published in the upcoming special issue on Salomé in the online journal The Oscholars, published by The Rivendale Press (UK). The Dance of the Seven Veils is another example of Russell’s interpretive grappling with both Wilde’s play and Strauss’s opera. At first, the dance—a non-verbal, drawn-out, yet crucial moment in the action—presented a true problem for his visual translation. “Now, how do you show this in comics? It had to be a purely visual moment. 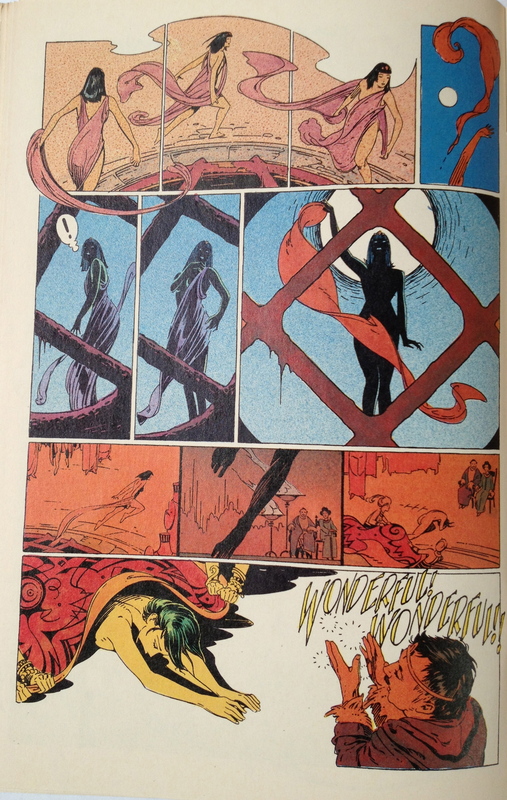 It couldn’t just be pictures and throwing off veils” (Comics Journal, 56). Working with Strauss’s detailed notes for the opera’s dance scenario, Russell decided to “use the dropping of each veil as a chance to comment on or advance the action.” For example, as Salomé throws off her veils, Russell inserts a sequence (interspersed with her dance) in which the soldiers carry and then throw the body of the dead Narraboth over a steep cliff (Fig. 6). “Instead of seeing the body bang against the rocks we see [Salomé’s] veil lightly fall on the floor. That’s neither in the play nor the opera. That’s what I played with, moving back and forth between the characters and the actions. And keeping it silent. I planned to have it work as a visual element in the story and make it almost a visual dance, not a literal dance of drawing her dancing.” Russell also interspersed the sequence with pictures in which Salomé is shown dancing in Narraboth’s blood, symbolically linking Salomé’s sensuality with the death of her first victim, and using it as a foreshadowing of her next victim (Jokanaan). The last veils symbolically fall on the executioner’s axe (Fig.6) and in the following panel (Fig. 7), there is another close-up of Salomé from below through the grid, this time as a naked silhouette dropping the last veil) right in front of Jokanaan’s cistern. As she throws up her last but one veil to the moon, it forms a question mark, and as she takes off the very last veil, Salomé is fully framed by the cistern grid (in front) and the large, full moon (from behind), affirming Wilde’s and Strauss’s connection between moon, femininity, and fatality one last time.